Prior to the takeoff of Spartan Roof Construction, and expanding into Spartan Unlimited, LLC., Jason followed his passion in personal fitness training by selling personal training as well as managing health clubs. He then progressed into the logistics industry working for his parent’s International Freight company. Then roof sales until Ashley seen the true heart and passion he had for helping homeowners, which led them to a running start of Spartan. As for Ashley she worked in aircraft maintenance for United/Continental Airlines for over 15 years. Together, they decided to open their own business, which has been a great success story ever since. Jason is originally from Northside Houston. Ashley is from Pittsburgh, Pennsylvania but grew up in Spring, Texas. They are so proud of their family, blessed to have three amazing kids: Samantha (25), Gannon (15), Bo (10), and their first grandchild Tatum Kinsley (1 yr.). As well as their son-in-law Mr. Billy Evans (28), and newest addition is their English Bulldog puppy “Moose”. When they aren’t out meeting customers, Jason and Ashley love spending time with their beautiful family, taking trips to Grandma’s house on Lake Conroe or excursions to the Hill Country. Their favorite vacations typically include a river, lake, or beach, still and all family always comes first. The Smiths love sports and are very passionate about fitness. They also own “Team Smith Fitness” and Ashley still has the passion to get on stage at fitness competitions. They love helping other people reach their own personal goals through nutrition and exercise. Jason and Ashley believe in “Ethics Above Everything”. They put themselves in the homeowners’ shoes, thinking “What would we do if this was our home?” Since they are very picky themselves and have lots of pride in their workmanship, the bar is set ski high. Need Financing? 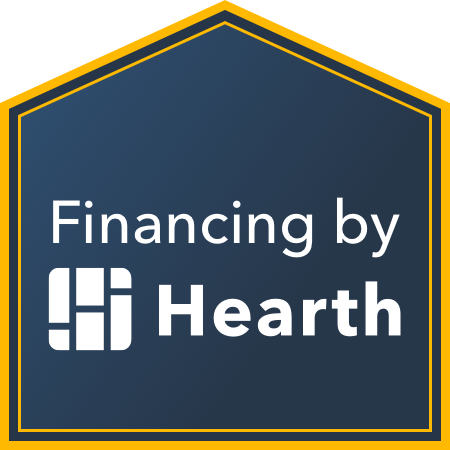 We work with Hearth to help homeowners with financing their roof. Hearth specializes in home renovation loans.